Basic Structure Or how to design a world. This is how it happens. You begin with the basics of the premise. Who populate the world? 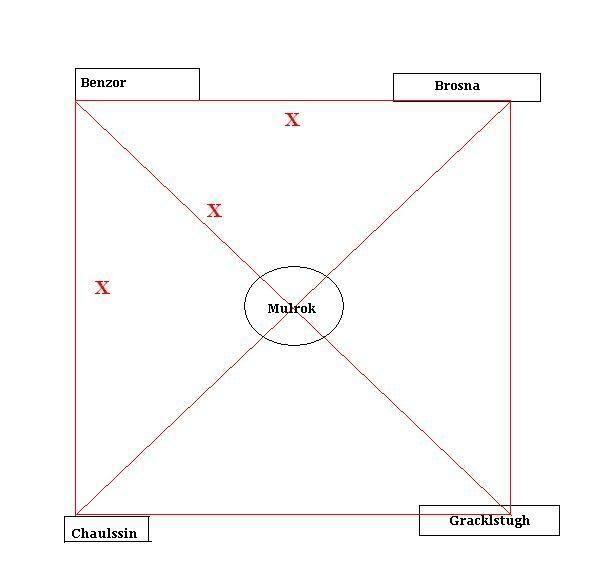 Start with major points, such as Brosna, Benzor, Gracklstugh and Chaulssin. These are the four Bases and between them, both in mentality as well as virtual distance, is the Neutral zone, which in this case is Mulrok. The number itself is arbitrary, it could be anything, but for the Nordock I use as an example, these are it. The Base is the central Point of Interest. Let's assume the ”distance” between them is standardized to begin with. That means, that within the framework of these four corners, there is a definite amount of adventuring to do to get from A to B. Where X is an equal amount of travel. Now, we determine X. X is the amount of Points of Interest between the Bases. For the hell of it, let's go with two to begin with. These are simple, logical PoIs. The frame structure is very logical. You can make a full circle from Base to Base, or you can take the short route from one corner to another through the neutral zone, Mulrok. But I can spot that the first, simple X=2 falls apart. There's no reason to have two PoIs between Benzor and Mulrok – it's one effin boat trip. The structure begins to take form. We erase the point of interest spots from between Benzor and Mulrok. Then we add some to another. Once we have a satisfying framework – the in-betweens of the Bases, we design those areas. The points of interest are the combining elements between Bases. With the current set-up, we have not designed any areas that are useless. Sure, long runs between places can be fun, but areas that are simply transitional are annoying. Solution: only make areas with a point. Good example of this is the Trommel Wood area. You have some lame mini encounters, but you also have Will-O-Wisps, which are essential for crafting and can't be found anywhere else with such little effort. Additionally, there's the hunting party of a green dragon AND the green dragon itself. And finally, there's the small Ogre Bandit encounter by the bridge, which with the current rules set-up could be turned into an actual event. The area therefore has three PoIs. It's not a useless run-through area like Benzor River Valley, which only harbors entrances to actual places. The design of transitional areas is out-dated. By following the example, we make all areas with PoIs. Then the structure also requires that the five central Bases all harbor at least the same amount of interest as they do now, preferrably more and in a more condensed form. Mulrok Village, for example, is damn lame. It's boring and there's nothing to see. This is the exact mentality that turns the module into a series of boring run-throughs, that take up space and are counter-intuitive. To get back to the point, we need a solid framework. There's no need to connect them before we have a long series of important or at least interesting PoIs between them. We can add PoI areas between them ad infinitum, but the basic structure needs to be solid. Once the four corner spaces are done, we can add more corners – a Necropolis, Trondor, Kabu etc. And in between them, once again ONLY cool areas. The basic structure of the set-up also requires that the Bases are well-made and we don't go anywhere before they are done, and done well and the creature has a skeleton. One of the big annoyances people have had over the years with Nordock, is the stagnation effect. Sometimes they add areas. Areas that are mostly monster grinds, many of the newly added places happen to be my favorite adventure sites. But they are just like feeding the creature more fatty foods. Since the entire focus of the multiplayer game is the player base, we need to make it feel lively and morphic. The word I use is organic. The players should have a large say in what's going to happen. New areas are found, not simply thrown on the pile. Quests to open the caved in entrance to the Pit are an example. As the player base grows in strength (we do not start with level 25 character running around) the more dangerous areas are discovered. Related to this, I'd like to make a suggestion about the Epic levels; they are likewise discovered at some point, by level 20 characters in a major quest plotline. Before Epic levels, the heroes are still mortal. Entering the world of Epic, they are given a hint of divinity and hence I suggest that they are opened to the players only after a while. Anyway, back on the topic. The discovery of areas should be continous. They can provide meat around the module, but there's no need to make the areas before the originals are done. People can be happy with just a dozen or two of adventuring sites, and they continue to do so. Once everyone feels it's time to expand, we add more areas. The other side of organic design in relation to the above, some areas will disappear. Once the King of Death has been rolled in a carpet and thrown into the river, his palace crumbles. And the area becomes ”the Ruins of the Black Horse Tower.” Which of course must harbor Points of Interest or else it violates my utopian design dream. More ways of player-induced change is something you pointed out, ie. the limited amount of resources – an often farmed monster area may become depleted of monsters, or inversely become flooded. If the flood happens, it should be DM monitored. And we can take it even further with little effort. The Horned Bowel cave system spills over with minotaurs and they in turn get their chance of grinding humans. They mass under the banner of Hasslehoof, and simply overtake Trondor with their army. We change the entire concept of an area with a quick plot hook. More organic design goals should also include things like new crafting materials found by the dwarves of Urthgram Tor, and the crafting system expands a little further, this is similar to the discovery of Epic levels. Other things to consider with the design goals is the expansion of religion by the Crusaders of Rot, the cult of the Death Dragon. If there's a player group like that, they again may take over a city or an area's religious majority. Seasons are another part of morphic design. In accordance to the summer-winter cycle of Real Life time, could turn the areas snowy with cold or dry with heat. This opens again more options, like low-level quests that can be repeated all summer. New watering for the crops or delivering fresh hay for the cows. This may be taking it too far, though, because it may require massive overhauls twice a year... Up for us to decide later. All in all, what I'm saying is that the players can start a tavern or hold their shops (PCs should always have the chance to turn their old characters into NPCs, like storekeeps or tavern owners), they can do the old school ”we dug too deep!” sets and they need to work together to expand their world. We can even give leeway to inventive players, like providing them with personal Henchmen or signature weapons et cetera. The Dev team and the DM team should be responsive. We need back-up plans and persistent, consistent and inspired DMs who are up to the task. Resignation should be done if a DM feels he can't be active. I think, with the very limited amount of players, we need to be able to accommodate them to the best of our ability. We need a hook. Organic design should be that hook.